The Milwaukee Brewers real name should be The Milwaukee Tigers because it seems as though there is a pipeline which runs six hours west of Detroit on I-94 in the city located off of Lake Michigan. Former Detroit Tigers Assistant Hitting Coach Darnell Coles now calls the State of Wisconsin his professional home. In 2016, third baseman Hernan Perez, 26, found himself bouncing all over the diamond in what I call The "Mr. Versatility" role which Andrew Romine wears well for the Tigers. Last season, Perez appeared in 123 games, amassed 404 at bats, 13 HR, 56 RBI, with 34 stolen bases to go along with a .272 average. He's a bargain for the small market Brewers as he earns $545,700, but has been a good find for the team which plays its home games in Miller Park, a venue, I got married in earlier this year. Perez played with the Detroit Tigers in 2015. Over the last few weeks, Milwaukee made attempts to trade for Tigers second baseman Ian Kinsler, however that situation never materialized. But the bigger coup for Milwaukee has been the emergence of 25-year old closer Corey Knebel, the Denton TX. native. 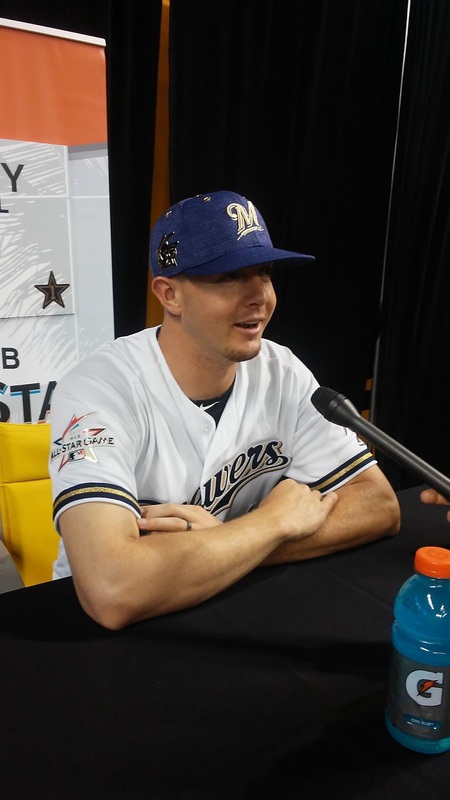 Knebel is the primary reason the Milwaukee Brewers are contenders in a year which they projected to be in rebuilding mode. Going into this post, the Brewers are 63-60 and trail the World Champion Chicago Cubs (64-57) by two games in the National League Central Division. Knebel has been a steal for the Brewers earning $538,900. He is 1-2 with a 1.41 ERA in 57 games, 24 saves in 57.1 innings striking out 98 hitters. 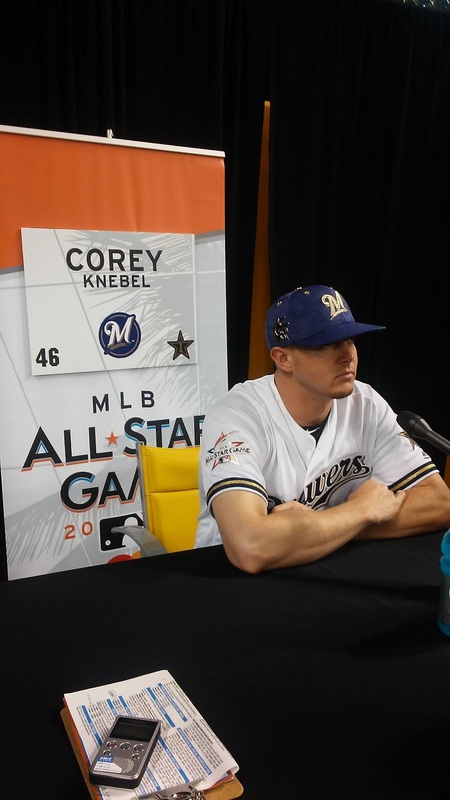 Knebel made his first All-Star Appearance in Miami earlier this year. I had the chance to catch up with the Tigers former prospect during Monday's Media Day at Marlins Park at his table before other media members got to him. Q: How excited are you being selected to the All-Star Game? A: Being at the All-Star Game is a real big thrill for me. I enjoy being around my teammates and it's something I'll never forget. To create new friendships is real special. Q: How do you like playing for a small market team in Milwaukee where there isn't as much media? A: This is a great baseball city and the fans are real supportive. They come out to the ballpark and appreciate the effort we put on the field. When you have fans like this, it makes coming out to the ballpark more enjoyable. I can imagine what the crowds will be like as we get closer to the playoffs. Q: Did you expect the Brewers to have success in a year where the expectations were not as high? A: We felt coming into Spring Training we had a good team. We don't have the bigger names that other teams have, but we play hard. My teammates pull for one another in the clubhouse and I expect us to keep this going during the second half of the season. Q: I view Milwaukee as a team which is on house money because the Chicago Cubs were the favorites going into the season. Does your team relish the underdog role? A: We sure do because nobody expected us outside of the clubhouse to have success. So we're just going to enjoy this and continue to improve and get better. This will be great experience for us playing meaningful baseball, therefore it's easy to relax when expectations aren't as high, then teams begin to notice us. Q: How much do you enjoy the challenge of being a closer? A: The Tigers prepared me for this when I was in the Minor Leagues. I enjoy closing and my goal is to get better with every game that I play. Q: Former Brewers closer Francisco Rodriguez flamed out earlier this season and was cut by Detroit. I'm sure the Tigers could use your help now. A: I enjoyed my time with the Tigers. I'm sure they'll figure all of this out. I wish them nothing but the best and appreciated the opportunity they gave me to play baseball in their organization. Detroit drafted Knebel with the 39th overall selection in the 2013 draft. He made his Major League debut for the Tigers in 2014 at 22 years old. 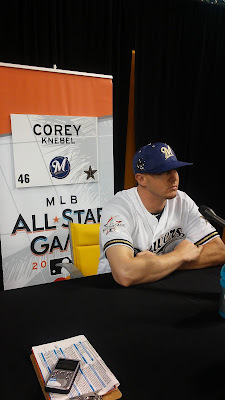 Knebel appeared in eight games, posting a 6.23 ERA and 11 strikeouts over 8.2 innings pitched. Knebel falls into the category of what ifs and with the Tigers bullpen struggles through the years, with a little more patience, it's safe to say that the cliché which suits this situation is "The One That Got Away." As of this post, the Tigers are 53-69 and now Detroit is heading for a massive rebuilding project. The American League defeated the National League 2-1 in 10 innings in the contest which took place on July 11. Knebel didn't have the opportunity to pitch, however, there is no doubt this is an accomplishment he'll cherish the rest of his career. At the rate he's going I have a feeling that he'll see this Mid-Summer Big Stage again. He won't be a bargain next season with a hefty raise and is going to make a seven figure income in 2017. Scott Morganroth is a Member of Detroit Sports Media and took these photographs.